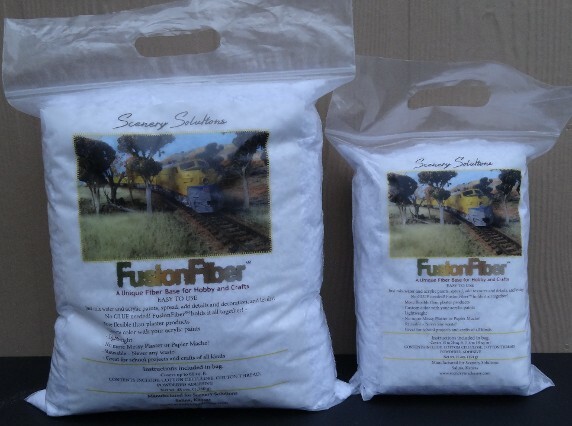 Create beautiful scenery with Fusion Fiber! Watch Dugan as he demonstrates how to use Fusion Fiber to make easy and realistic scenery! 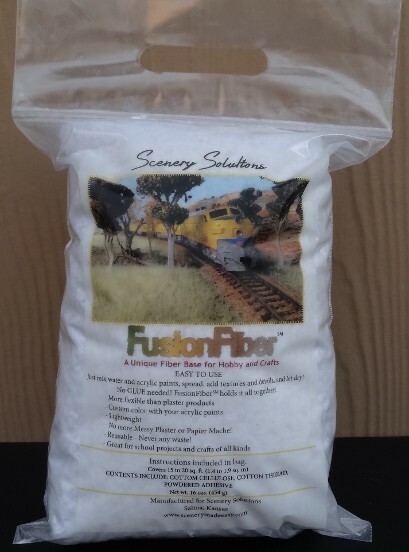 Fusion Fiber is a unique base material. It is lightweight and contains a powder adhesive that you mix with warm water and acrylic craft paint to create the color you want and then spread on your base. You then add your ground colors of foam or textures of rock and shrubs, lichen, and other materials and then you lightly mist it with wet water to wick the adhesive up into the textures and when it dries everything is held in place. There is no rush, Fusion Fiber gives you a lot of working time and takes 2-3 days to completely cure depending on heat and humidity. And there is no waste, any material left over can be simply dried out and when you are ready to use it again you re hydrate it and you are ready to go back to work creating your scene's. A 1lb bag will cover 15 to 20 square feet and makes modeling fun, fast, and easy. No expert techniques needed just a little imagination and you can build beautiful scenery that looks like it was professionally done. Eliminate the numerous steps and the mess and weight of using the plaster methods and try Fusion Fiber, once you have tried it you will love it!! NOW in our new resealable bag!! For the bigger projects at a volumn price, covers up to 50 sq ft. Go to the Shop Now page and order today! 9. Rehydratable, there is no waste when mixed with acyrlic paints, if you mix to much put a lid on the container or let it dry out and when you are ready to go again add enough warm water to loosen back up to a stiff oatmeal consistency and move on with your project. 7. No Extra Painting Step, Fusion Fiber tints easily and uniformly with acrylis craft paints, so you eliminate several steps. 6. No Glue Step, there is a powdered adhesive added to the fiber, once you spread it on your surface just add the textures to create your scene then lightly mist with wet water so the adhesive wicks up into your textures and when it dries everything is glued in place. Rock castins, portals, retaining walls etc can be set with the Fusion Fiber also, again eliminating several steps! 5. Provides Texture and Depth, tinted to look like the dirt/soil, Fusion Fiber is the layer of top soil for earth based scenes providing realistic depth to grassy areas and a burying layer for buildings to appear naturally situated and trees planted right into the fiber. 4. Vertical Application, Fusion Fiber works great for modeling flat face vertical mountains, clouds and mountains on backdrops. 3. Sculpting applications, lump and mound for sculpting rocks and boulders and strata faced cliffs and moutains, Due to the fiber content though it does not mold well for detailed rocks, plaster cast mold those and use the Fusion Fiber to set them in place. 2. Mess-Free, work on scenery while running trains! track wipes clean with warm damp cloth, hands and tools clean up easy with water and soap. 1. Easy and Economical, can be applied easily with no special tools and so clean children as young as 5 can help supervising adults do a beautiful job making natural looking scenery. A one pound bag will cover up to 20 sq ft which usually will cover a 4x8 layout after the buildings and track and other items are figured in.